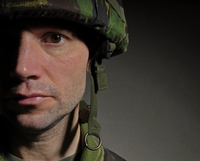 Post Traumatic Stress Disorder (PTSD) can be a result of many things: physical and sexual abuse, divorce, bombings, fires, beatings and military battle. Someone who has lived through one or many of these tends to relive the event over & over — often many years after the fact and with devastating impact to their health,. The World Health Organization estimates that approximately 20% percent of people exposed to a disaster develop a mild or moderate mental disorder soon after the event. That number decreases to 15% percent within a year; 3-4% percent will have more severe problems. According to Wikipedia, PTSD is a “severe anxiety disorder that can develop after exposure to any event which results in psychological trauma. This event may involve the threat of death to oneself or to someone else, or to one’s own or someone else’s physical, sexual, or psychological integrity, overwhelming the individual’s ability to cope. Symptoms can include: loss of interest and feeling emotionally numb, detachment from loved ones and family activities, behavioral avoidance (such as avoiding reminders of the trauma) as well as anger, sleep disturbance, and difficulty concentrating. Some sufferers of PTSD are unable to recall specific aspects of the trauma, though it is typical to experience intrusions in thoughts or dreams, or to have “flashbacks”. PTSD sufferers who are treated with homeopathy will experience being listened to in a way that is different from counseling, though psychological counseling is recommended for this disorder as well. Homeopaths give PTSD sufferers a lot of time to describe their experience & the impact it has had on them and their family. We don’t judge the reality of the experience nor do we suggest a different reality. Homeopaths accept that the patient’s experience is real for them. There are many symptoms in the homeopathic repertory that focus on mental and emotional symptoms such as anger, brooking, thoughts of death, blaming oneself for another’s death (survivor’s guilt), confusion, absorbed in thought, grief, wounded honor, helplessless, fear and desire to escape, sadness, suicidal tendencies etc. As the sufferer describes his or her experience the homeopath looks to this repertory to find a remedy that will aid the sufferer in recovering from PTSD. House calls in the Denver/Boulder area.